5 years ago, French-American Chamber of Commerce of Los Angeles was founded by a group of French-American Entrepreneurs eager to help French companies wanting to settle in Southern California. Many success stories later, it has become the largest network of French-American businesses in SoCal. The company works hard every day to leverage this network and contribute to your success in the US. 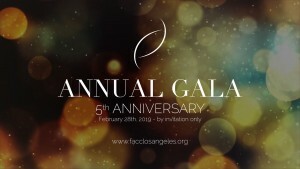 On February 28th, 2019, to honor the Los Angeles French American Chamber of commerce‘s 5th anniversary, a convivial gala has been organized! Do not forget to reply to the invitation you received!